I recently reviewed my first Deschutes beer, Mirror Pond Pale Ale, the Oregon brewery's most popular offering. What better choice for the next review than the beer the company defines as its flagship? Named after an extinct volcano in nearby Sisters, Black Butte Porter dates back to the first days of Deschutes back in 1988. Deschutes doesn't provide much information on the ingredients, but Jonathon over at The Beerocrat called them up and got the details. The hops used are Cascade, Galena, and Tettnanger, while the malts used are Chocolate, Wheat, and mid-level Caramel. Nicely done, Jonathon. 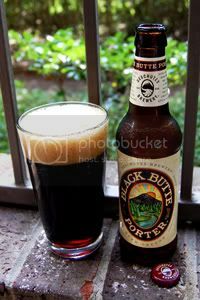 Black Butte is rich in flavor yet easy to drink, with a creamy, smooth mouth feel. The slight hop bitterness up front only enhances the distinctive chocolate and roasted finish to come. Sounds good to me, let's dive into this volcano. Appearance: A hazy, deep dark brown body with ruby highlights and a finger and a half of caramel-tinged head. It leaves a fantastic curtain of lacing that leaves the glass virtually opaque. Aroma: Roasted malt, bitter chocolate, and dark coffee with hop notes around the edge. The classic Porter aromas, used to great effect here. Taste: Much the same in flavor as in taste. An abundance of rich, roasty, and chocolaty malt. There's a splash of hop bitterness in the back for added complexity. The aftertaste is of roasted malt and bitter coffee. Mouthfeel: Medium-bodied and velvety with a smooth carbonation. It coasts the mouth well, allowing the flavors to linger a long time. Drinkability: With a tasty flavor profile, a medium body, and the alcohol content clocking in at just over five percent, this is a very drinkable beer. If you love dark malt, you could drink this all night. Verdict: Black Butte is smooth, chocolaty, and tasty as all hell. Well worth seeking out for fans of Porter, Deschutes have brewed up a solid example of the style here. One of my absolute favorite porters. And porters are one of my favorite styles. This beer is just delicious. And smooth. The two characteristics my palate loves. It's right up there with Pipeline Porter by Kona Brewing as the most drinkable porters I know. Love it.